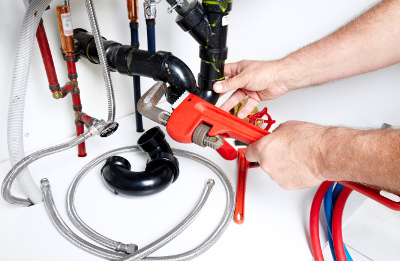 We’ll be the first to tell you that there’s no substitute for the expertise of a licensed plumber. But for simple jobs — or emergencies, like a broken pipe — it doesn’t hurt to be prepared to get your own hands dirty. And if you’re going to be ready for what your home’s plumbing can throw at you, you’ll need the right tools for the job. Pipe wrench. Or rather, pipe wrenches. Two is better than one when it comes to these hefty grippers, because you can use one wrench to stabilize your work while using the other one to turn. The pipe wrench is your go-to tool for situations that demand real leverage, such as loosening a rusted old fitting. It’s a good idea to throw a few rags in your toolbox along with your wrenches — that way, you can wrap your pipes and fixtures before you work, avoiding scratches. Basin wrench. If you’re not familiar with plumbing tools, you might not recognize the basin wrench as a wrench at all. Unlike a typical wrench head, the basin wrench has a spring-loaded, clamping jaw designed for gripping and turning bolts and fasteners in tight spaces. It’s the ideal tool for jobs like loosening the nuts underneath a deep kitchen sink. Adjustable wrench. As the name suggests, these wrenches can be adjusted to fit a range of hardware sizes, making them very versatile. Quality adjustable wrenches are inexpensive and it can be useful to have a few of them in a variety of sizes, especially when you need to use one or two as clamps. Adjustable wrenches do most of the work with smaller jobs like replacing faucets and showerheads. Tongue and groove pliers. Speaking of clamps, you’ll also want at least one good pair of tongue and groove pliers to help hold things in place. These pliers have a slip-joint design that allow the jaws to open wide and grab bigger things. Most pairs have long handles that also make them great for turning, tightening and loosening. As with your pipe wrench, you’ll probably want to wrap your fine fixtures with a rag before using these due to their serrated jaws. Plumber’s putty. Also known as jointing compound, plumber’s putty helps form a watertight seal. For many DIY replacements and upgrades such as faucets and drains, a dab of plumber’s putty can help avoid leaks and keep parts firmly in place. Plumber’s tape. One of the more frustrating plumbing problems is a leaky threaded joint, such as the one connecting a showerhead to a pipe. The solution is plumber’s tape, also known as teflon tape or thread seal tape. Just wrap a few layers around clean, dry threads, making sure to wind the tape clockwise. When you screw on your fixture, the tape will help form a watertight seal. Plunger. They don’t call it the “plumber’s helper” for nothing. From overflowing toilets to clogged drains, your plunger is the plumbing tool you may find yourself reaching for most often. Keep it right in the bathroom so it’s always there when you need it. If you’re not familiar with proper plunger technique, take a moment to learn the ropes, and consider keeping a little tub of petroleum jelly under the sink to help you plunge more effectively. Toilet auger. When your plunger can’t get the job done, it’s time to bring out the auger. A hand-crank toilet auger can extend a long metal cable into your toilet drain (or any drain where it will fit) to break up obstructions and send them on their way. For stubborn clogs, it’s a cheap and simple tool that could save you an emergency repair call. You probably have a few of these tools in your toolbox already, and rounding out the list won’t cost an arm and a leg. Even if you don’t expect to get into any major DIY work, having these tools on hand might make the difference between calling for emergency repairs and handling it yourself. But if you ever do find you need the help of a licensed plumber, call your local Rods Away without delay.